Our in house Electrical Engineer has personally installed over 500 Solar systems. We guarantee that his design knowledge is at the forefront of the solar industry. No matter what size solar system you are thinking about we can assist you. Gold Coast Energy will guide you through all the steps and at each level. Our goal is to ensure this process an enjoyable experience for you. We offer full design systems and guarantee our results. Contact us today for a obligation free feasibility assessment of your commercial premises large or small. When consulting on a Solar installation, our Electricians will install a data logger on your premises. This will assist in determining the best possible solution for your business. Our experience in design and electrical understanding of Solar systems makes us a sensible choice for reliability and proficiency. We give all installations a free first year call back for a full analysis of the system. We offer a 5 year first call back for larger installations. 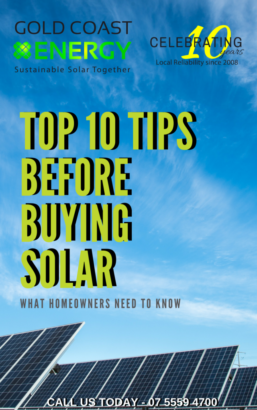 Our in-depth report will give you different options in how to save energy usage as well as designing your solar system. The buzz of excitement generated around Tesla Energy and the Powerwall in Australia, has been building over the last 12 months, with the Tesla Powerwall. THE CLEANER YOUR PANELS ARE, THE CHEAPER THE POWER! When you decided to install solar, it wasn’t a decision you would have taken lightly. After all it is your home or business that you are adding a long term investment to. Still on the fence about moving your business to solar power? Energy costs are on the rise so, there’s never been a better time to make the smart shift to Solar.